I owned a 1995 Ford Probe GT up until December of 1999 when I bought a new Mazda Miata. The Probe was one of the best cars I've ever owned. If they would still have been available, I would have bought another one. Unfortunately, Ford discontinued this model in June of 1997 after years of neglect (they never really advertised it, preferring to push the Mustang). I looked at the Mercury Cougar, and while it was a nice car, it wasn't quite as performance oriented as the Probe was. I ended up with a 1999 Mazda Miata which is a really fun car. My '95 Probe GT was mostly stock as I ran it in Stock class in SCCA Solo II competition. Stock class only allows very minimal mechanical modifications. The only ones I had done were a K&N air filter element, a set of Magnecor plug wires, and a set of 4 competition tires. I had also added a Pioneer CD changer and a Draw-tite receiver hitch that I used for both a bike rack and my tire trailer. 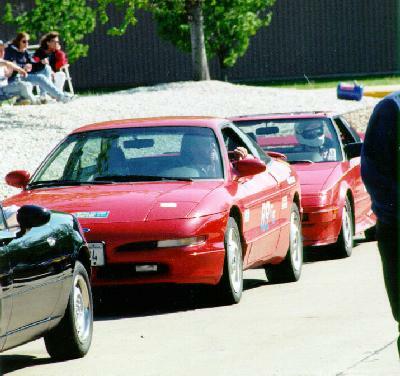 My Probe sitting in grid at the May 4th, 1997 Solo Event. There go the R-1's!!! $$$$ Coming out of a hairpin turn. It's floored in 2nd gear. Speed is about 35mph and accelerating. I have to admit that conditions were perfect for smoking the tires that day, and I've never been able to duplicate it to this degree. More Pictures of various Solo Events including other photos from May 4th, 1997! This page is no longer being updated. It's still here mostly because I like the car so much. Also some people had the "smoke" pictures linked. Mercury division of Ford Motor Company Direct to the new Cougar area!